Any additional crabbing equipment can be picked up at the same time you pick up your clams. Email or text Captain Bruce at 443-693-2438 with orders or questions. Pick up at the crab porch refrigerator: If you want to be sure you have bait, you need to text, call or email ahead to reserve your bait. You can either pay ONLINE with your credit card or put the cash in the top of the cash box that's located on the refrigerator door when you pick up your bait. 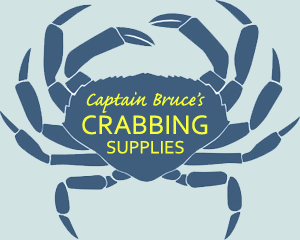 Other crabbing gear can be picked up 24/7 when you pick up your bait. Contact Captain Bruce for details. You can also CALL 410.287.6315 or TEXT 443.693.2438 or EMAIL captainbruce53@aol.com. *Kept and sold frozen to guarantee that your bait is always fresh. **WE WILL NOT BE SELLING CLAMS BY THE BUSHEL. CASH customers, click here for the order form.